Early in my museum career I interned at the Hyde Collection in Glens Falls, New York. That summer, I was very interested in the new temporary exhibition being installed, since most of my museum experience up to that date had been exhibition related. I vividly remember the riggers, preparators and curators trying to move these monumental sculptures into the gallery for the exhibition titled Confluence: Sculpture & Drawings by John Van Alstine. I was awestruck by the size of the sculpture and how John could suspend gigantic pieces of stone from seemingly small metal structures. This was a mystery to me. 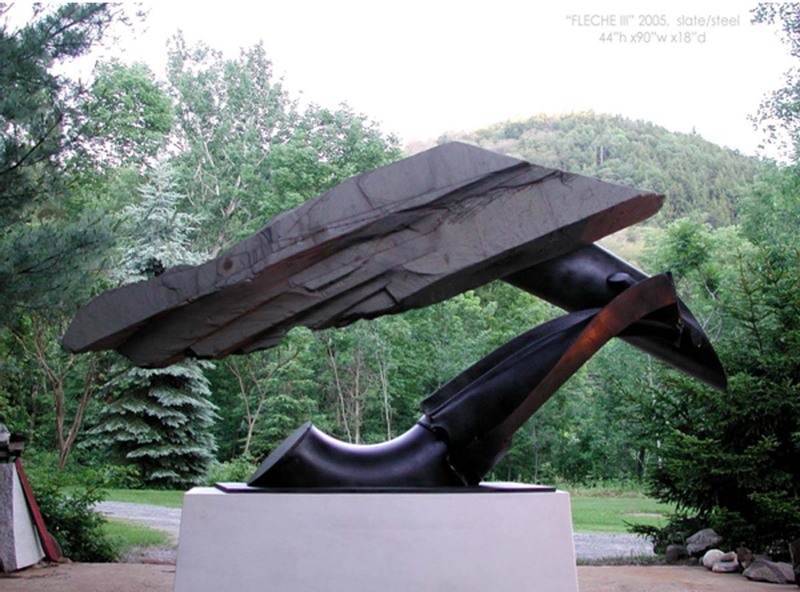 It was pieces like Fleche III (pictured below) and even larger sculptures that blew me away. How did he suspend these huge pieces of slate, granite and other stone in mid-air like that? 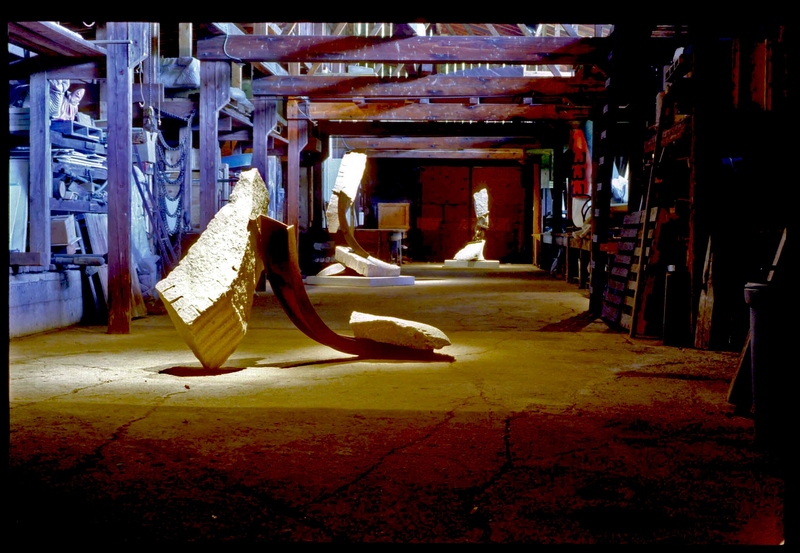 When I started at Grounds For Sculpture, I saw his work there, but it did not click for some time that the 1999 exhibit at the Hyde Collection and Van Alstine’s Stone Pile and Juggler pieces at GFS were by the same artist. When I moved back to New York, I knew John’s studio was not far from me. After two years of living in New York, I asked if I could visit. 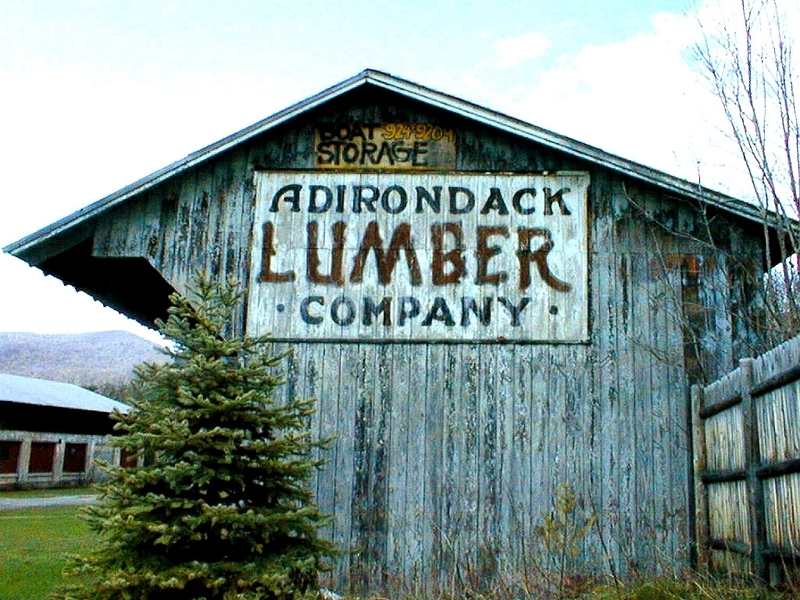 On one of the most pleasant summer days this season, I had the pleasure of visiting John Van Alstine’s studio in the Adirondacks on the site of what had been the Adirondack Lumber Company. John’s studio is tucked away into a spacious piece of land, though it is right next to one of the main roads. A thick area of trees on one side, and the Sacandaga River on the other, provide solace. 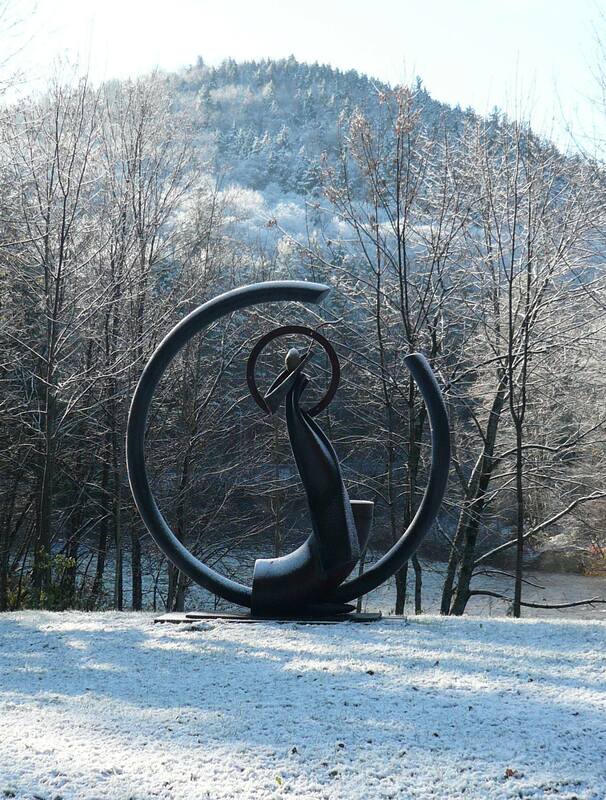 The buildings are laid out across the landscape; the sculpture garden immaculate with his stunning works sited beautifully. The site consists of several structures, most of them, as you can imagine, very large. These buildings, woven into local history, can accommodate John’s sculpture, regardless of size. 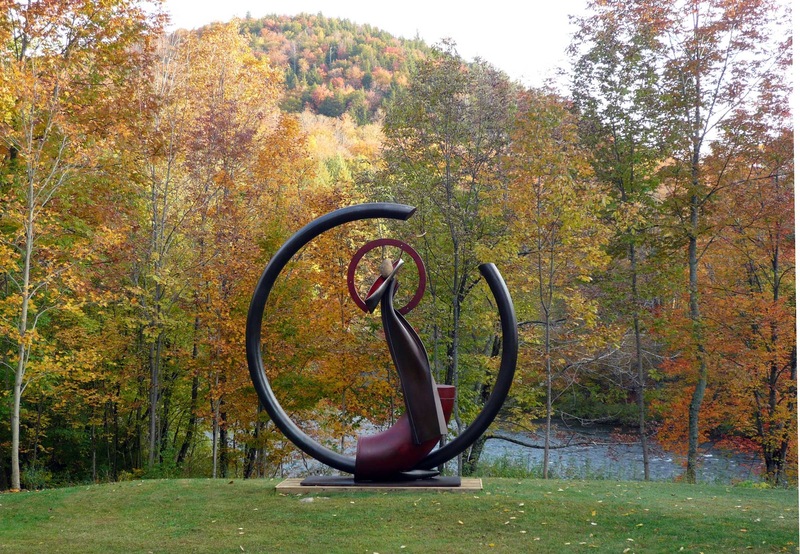 His sculptures range from small scale pieces on finely-made pedestals that fit in gallery spaces (such as the dozens in his own gallery), to the monumental, grand sculpture exhibited in large gallery spaces or out-of-doors. 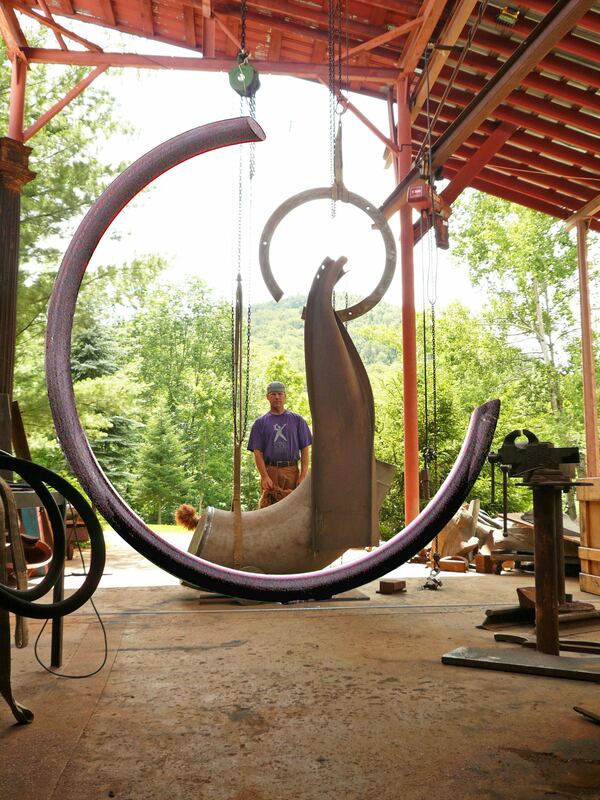 A space for large sculpture at John Van Alstine’s studio. John’s work is rooted in myth and story. His pieces are laden with symbolism. Each part of the sculpture is thoughtfully composed. As John states, his work is a “marriage between natural and manmade things.” John visits quarries, finding large pieces of compelling stone. He visits docks, and drives around the countryside looking for found objects to cast and use later when they fit a particular piece. Let me show you a couple examples of this union which I was able to see first-hand at his studio. 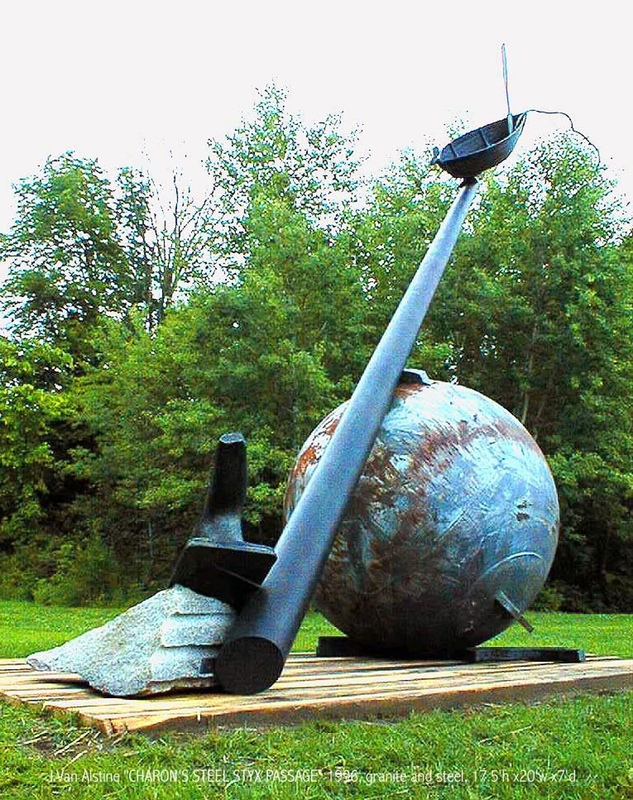 One of the first sculptures John showed me was Charon’s Steel Styx Passage. This sculpture, based on the Egyptians’ travel along the river Styx to the afterlife, is cleverly created with symbols of the journey and of life on earth, referenced with man-made and natural objects. Life has its joys and its burdens. You are constantly challenged to make the best of your life and to make it into the beyond. You maintain and are maintained by people, circumstances, priorities, obligations. This leads you to decisions on how to live your life. What will you take with you or leave behind? Is your oar in the boat with you in life, or teetering on the edge of the rail? Will you cast off your bow-line and in what manner will you do it? What in this life is holding you back? All of these things are symbolized in this piece in John’s unique way. Just look closely and think about these questions. One of the symbols John has included in this piece is the coin on the bow of the boat. Charon would lead people to the underworld, but in order to get there, he required payment. Should a person not pay Charon, he would be stuck between life and death for eternity, a most terrifying limbo. Thus coins were put on the eyes or on the tongue as payment for the ferryman Charon, a willing guide to the afterlife. Just as the coin rested on the eyes, here the coin “rests” on the bow of the boat. Sisyphean Holiday (Portals and Passages) in production. H: 12’6′ x W: 12′ 6″ x D: 4″. John has created many sculptures in this series. Each sculpture starts with a stone and the circle, various found objects and the myth in mind. After creating several works in the series John decided he needed a break and moved on to create other sculpture. During that time, he also made the piece Sisyphean Holiday. I will not tell you all the symbolism in this piece. All I will point out is: where is the stone placed? Sisyphean Holiday (Portals and Passages). H: 12’6′ x W: 12′ 6″ x D: 4″. Sisyphean Holiday (Portals and Passages). H: 12’6′ x W: 12′ 6″ x D: 4″.he also made the piece Sisyphean Holiday. I will not tell you all the symbolism in this piece. All I will point out is: where is the stone placed? Was the thirteen year mystery of how these large stones were suspended out in space such as in Fleche III solved during my visit? It was, but I will not reveal any more secrets of the artist. To learn more about John Van Alstine visit his website. To see him on exhibition this summer, visit Silver Bay in Lake George, NY or his exhibition at Opalka Gallery at Sage Colleges in Albany, NY. Nice article Christina. Certainly put The Juggler at The Grounds in perspective. Great to see you the other day! Christina, Excellent insights into life and afterlife symbolic nature of John Van Alstine’s work. “Sisyphean Holiday” is an especially pleasing concept mentally and visually.